The Wii may have been the worst console for sports video games ever—not "worst major," not "worst of its generation," flat out the worst console for sports video games. I know it had Tiger Woods PGA Tour, and that version often outperformed the high-definition consoles in reviewer scores. But the prototypical Wii sports video games were either cartoony arcade spinoffs or cartoony afterthought ports of simulation franchises or exergaming titles, nearly all of it helping cultivate the kid's-stuff image that console's fans so resented. So, from sports gamers, goodbye and good riddance, Wii. I know sports developers weren't crazy about having to develop for you, either. But that doesn't excuse the almost spiteful release of FIFA 13, probably the last major sports game to publish on the Wii. As Nintendo Gamer points out, the thing really is the worst slur you could call a sports video game: A roster update. 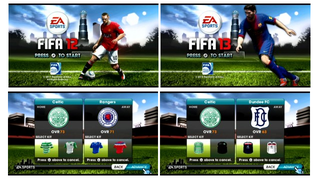 "Here's a complete list of everything that's new in FIFA 13 compared to last year's game," Scullion wrote in his review of the game for Official Nintendo Magazine UK, the only outlet to review it so far (nearly everyone gave up on reviewing sports titles on the Wii. You can't find a Metacritic average for any title published in nearly a year). "The squads and kits have been updated. The menu music is new. The picture of Wayne Rooney on the title screen has been replaced with one of Lionel Messi," he says. "That's it." You really get a game no different than FIFA 12, so if you've got that on the Wii, a) God help you and b) save your money for a Wii U, or some other console that plays a proper game of football.